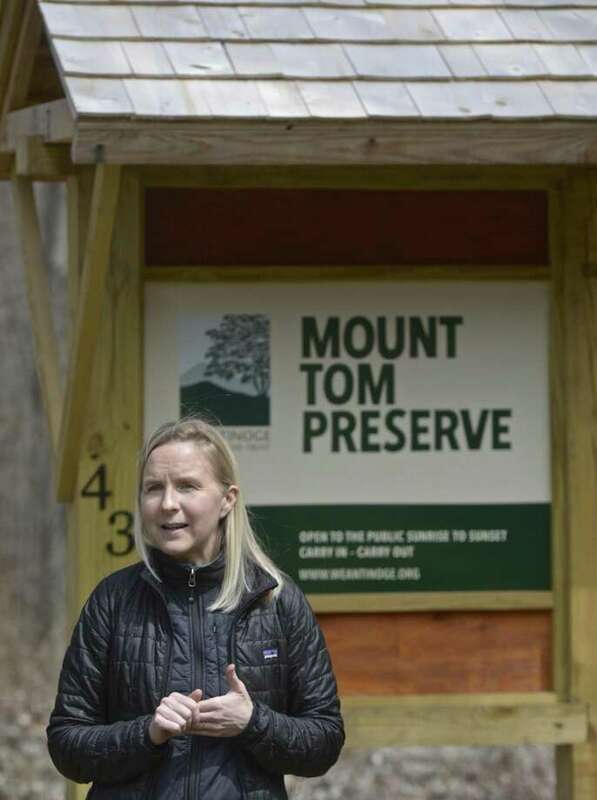 Weantinoge Heritage Land Trust Executive Director Catherine Rawson speaks at the reopening of the group’s Mount Tom Preserve on Thursday afternoon after significant improvements. Thursday, April 11, 2019, New Milford, Conn.
NEW MILFORD — With one look, hikers can recognize the improvements made to the Mount Tom Preserve in 2018. A wooden kiosk with a new sign and map greet hikers as they arrive at the enlarged grass parking area. The trails are clear of barberry, and new planks and two bridges were added to help hikers travel the wet portions of the nearly two-mile loop trail. Signs were installed, marking the orange and white trails, the overlook and the parking areas. The preserve officially reopened Thursday with a lunchtime hike and brief speeches from those involved with the work. Catherine Rawson, Weantinoge’s executive director, said the land trust is working to improve all 12 of its preserves over the next two years. “Each of our preserves needed up-front investments and plans for longterm maintenance,” she said. The improvements were funded by a $10,000 grant from the Connecticut Community Foundation and a $5,000 grant from the Iroquois Pipeline Community Grant Program, which covered signs at five of the other preserves. Bob Bailey, a New Milford resident and chairman of the community foundation’s environment committee, said they were drawn to this project because of the volunteer aspect, which allows dollars to go further. The New Milford Youth Agency did a bulk of the work at the Mount Tom Preserve, including building the kiosk and bridges. The agency has been partnering with Weantinoge for years and built Mount Tom’s original trails in the 1980s. Town employees and the youth agency volunteered more than 225 hours to help. Neighbors keep the parking lot mowed and remove the leaves in the fall. One couple allows the white trail to go through its property. Rawson said they could not do this work without the grants. Mayor Pete Bass said he frequents the trail and thanked Weantinoge for its stewardship and conservation efforts that are helping the town approach the state goal of preserving 21 percent of its land mass. Speakers applauded the beauty of the preserve and available trails, which extend to the Pratt Nature Center. The preserve features a vernal pool. “You can really get long, extended hikes in nature,” Rawson said.